Chicago, Ill. – August 11, 2016 – Clover Imaging Group is proud to announce that its Mexicali, Mexico facility of Clover Environmental Solutions (CES) has achieved the R2:2013 Standard, the premier global environmental, worker health and safety standard for the electronics refurbishing and recycling industry. CES Mexicali is the heart of Clover’s cartridge collection operation and processes nearly 3,000,000 units a month. As part of the yearlong process conducted through a third party audit, the Clover team developed and confirmed processes for the security of shipments, enhanced storage of products, and confirmed that partnering transportation companies carry the proper insurance levels and licensing requirements. As part of the certification, Clover will track products through the downstream vendor chain to ensure compliance. In addition, a robust health and safety system under OHSAS 18001 was implemented and certified. To find out more information about the R2 Standard, please visit sustainableelectronics.org. The MPSA is pleased to announce the winners of its Global 2016 MPSA MPS Awards. The Global MPSA MPS Awards were established in 2010 to honor those companies that have excelled in various areas related to managed print. Winners serve as shining examples to the community regarding their commitment and expertise in managed print services (MPS). An esteemed judging panel of industry leaders, chosen from the MPSA membership and led by members of the MPSA Executive Committee to ensure impartiality and adherence to guidelines, vetted and scored awards submissions. The company scoring highest in each category was deemed winner of the respective award. This award is intended to single out organizations that have established new developments and initiatives in MPS that have the potential to redefine the way we view the industry. An independent organization selling Basic managed print services and offers additional solutions such as document management, workflow, and/or business document processes. An organization providing the necessary component structure to MPS Services. Providers that provide MPS to end-user customers. This organization is not owned, directly or indirectly, by a manufacturer. A local regional organization that provides all or any aspects of managed print services in one or more countries of the following regions; Asia Pacific, Europe/Russia, India/Middle East/Africa, and South America, whether directly or indirectly. An organization that develops software for the managed print services sector, whether sales management, device management, user management, service management, or billing. An organization with more than one full-time employee providing training, research, or consultancy. An organization selling basic managed print services (supplies fulfilment, break/fix service, and equipment services) that is owned directly or indirectly by a manufacturer (includes branches and subsidiaries). Winners will be officially recognized at the 2016 Global MPSA MPS Awards Ceremony on Monday, Aug 1, at CompTIA’s ChannelCon event, 5-6 p.m. in the Atlantic Ballroom of the Diplomat Hotel & Spa in Hollywood, Florida. Chicago, Ill. – July 28, 2016 – Clover Imaging Group (CIG) is launching a partnership with the award-winning Print Audit to offer an innovative managed print solution, Print Audit Premier. The new tool monitors remotely both print devices as well as users with cost-per-seat (CPS) billing. Print Audit Premier enables organizations to implement user and application based rules to monitor and control print behavior — lowering significantly the cost and environmental impact of printing and photocopying. As the most complete total cost of ownership tool in the industry, CIG’s Axess Managed Print Services (MPS) solution now calculates the CPS with Print Audit Premier by inputting the number of users and breaking down the total cost of print into a neat monthly figure. "CIG is excited to partner with Print Audit on our CPS offering,” said Aldo Spensieri, Vice President of MPS Solutions. “The Axess CPS offering will better align dealer and customer goals. We are on the verge of a new way to deliver managed print, and CIG is proud to lead the way." The commoditization of the printed page and the race to see who can offer cost per page (CPP) at the cheapest price are big factors in significantly reduced margins for dealers. On top of reduced margins, every time a dealer shows a customer how to print smarter by optimizing their print environment, the dealer reduces their revenue stream. Controlling or even modifying print behavior allows both the imaging provider and the customer to drive efficiencies and reduce costs related to print and document services. Protecting revenue and margins must be the ultimate goal for the dealer. Cost-per-seat billing allows dealerships to optimize the customer print environment as they help move clients from an expensive device to a cheaper device, and move color prints to black and white prints, based on user and application rules, for example. Doing so reduces the cost of print while maintaining revenue because now the dealer bills by the seat and not by the page — protecting revenue and increasing margins. Print Audit Premier is an intuitive web-based total cost of ownership (TCO) tool that empowers dealers to price contracts with accuracy by linking to individual account information. This revolutionary MPS tool both remotely monitors devices and manages users. The program gives detailed information about each print job, uses rules to cut printing costs, and gives the ability to the customer to follow securely the print and releasing it when the user is at the device. In addition, the customer will be able to charge the print back to the user or department for better accountability and control. For more information about Axess MPS and CPS, please visit http://www.cloverimaging.com/axess-mps. July 26, 2016 – Chicago, IL –Clover Technologies Group, the parent company of Clover Imaging Group, Clover Wireless and Clover Telecom, announced today the launch of a new, enhanced Clovertech.com that consolidates all of its global business units into one intuitive, content-rich website. Clover Technologies Group continues to lead the industry in helping businesses reclaim value by innovating new solutions for retired assets. This new website allows users to view the broad scope and diversity of Clover’s entire business portfolio and to delve deeper into Clover’s unsurpassed value proposition. Partners, media and investors are now able to stay informed of the latest company news by accessing press releases and news articles for all of Clover’s business units in one central archive. Clovertech.com also features an interactive map that enables users to explore all of Clover’s 60 locations in 18 countries as well as in-depth historical performance data and sustainability reporting. Clovertech.com was designed and developed for an optimal user experience utilizing the latest in responsive technology to make it easy to use regardless of device or browser. “In alignment with the evolution of our global strategy and initiatives, we redesigned Clovertech.com to give stakeholders a holistic view of our business and a deeper understanding of who we are and where we are going. Technology and innovation are at the core of everything we do at Clover, and this new website is a perfect reflection of that passion. We are excited to unveil it to the market and our partners,” said Mike Posch, SVP eCommerce, Product Management and Merchandising for Clover Technologies Group. Chicago, Ill. – July 21, 2016 – Clover Imaging Group remains committed to our Van Nuys facility (the former MSE facility), renewing the lease through the end of 2019 at 8201 Woodley Ave. The Van Nuys location will continue to be a central part of CIG’s U.S. distribution as well as manufacturing and packaging. The facility is also a key research and development center for color and monochrome toner. For more information about CIG and the MSE brand, please visit cloverimaging.com. July 14, 2016 — Dulles, Virginia — Digitek, an industry-leading provider of business growth tools, innovative services and top brand products that help resellers, copier dealers and office supply dealers to compete and win in the imaging space, announced that the company will co-sponsor a free webinar with BPO Media on July 20 at 2 p.m. EST titled “Should You Outsource Your Business Services? When to Leave it to the Experts.” The event is being co-presented with The Imaging Channel. For information on Digitek’s Partner Pro, the imaging industry’s first single sign-on business growth platform that combines professional sales training and digital marketing programs visit http://partnerpro.digitek.com, or contact Aaron Dyck at 888-353-0301 x 1196 or at adyck@digitek.com. Digitek is an industry-leading provider of value-added services and products that help our customers compete and win in the imaging space. Our Partner Pro™ business growth platform helps service and solution providers to attract new customers, expand their MPS, MIT and other solutions portfolios, and grow their business value with the unique combination of on-demand, video-based professional sales training and digital marketing programs. Digitek is a distributor of OEM and compatible imaging supplies and hardware with national distribution for all the top brands, plus custom branded services and R2 Recycling capabilities. Visit www.digitek.com or call 888-353-0301. As MPS moves beyond print and MPS providers delve further into document management, ECM, managed IT and more, the channel continues to seek resources to understand and navigate the changing space. The Imaging Channel (www.TheImagingChannel.com) is an integrated resource to help address the shifting landscape, providing insight, information and resources, and creating a network between the OEM, dealer, vendor and reseller to bring together the leading market information, business concepts, strategies and people in the MPS market. (Pompano Beach, FL) The Managed Print Services Association (MPSA) is extending the submission deadline for accepting nominations for the Global 2016 MPSA MPS Awards to Friday, June 24th. The association plans to reveal the winners in each of 10 categories at the CompTIA ChannelCon 2016 event in Hollywood, FL in early August. The MPSA MPS Awards were established in 2010 to honor those companies that have excelled in various areas related to managed print. Winners are recognized as leaders, innovators, and dedicated members of the managed print services community. Nominations will be judged by a panel of MPSA leaders from a variety of backgrounds. MPSA membership must be current for nominations to be considered. The following ten categories of awards reflect the diversity of the managed print services industry. Each nomination form covers six areas, including the extent of the program or service, problem solved, and approaches used. Within each category description below, nominees can click on the link indicating "Form" to open a document submission form for that category. Once nominees have completed the submission form, they should save the document and email it to the 2016 Awards Committee by the June 24 deadline. Direct MPS Provider – An organization selling basic managed print services (supplies fulfillment, break/fix service, and equipment services) that is owned directly or indirectly by a manufacturer (includes branches and subsidiaries). Professional Services Provider – an organization with more than one full-time employee providing training, research, or consultancy. Software Provider – An organization that develops software for the managed print services sector, whether sales management, device management, user management, service management, or billing. Regional Managed Print Services Provider – A local or regional organization that provides all or any aspects of managed print services in one or more countries of the following regions; Asia Pacific, Europe/Russia, India/Middle East/Africa, and South America, whether directly or indirectly. Managed Print Infrastructure Provider – An organization providing the necessary component structure to MPS Services. Providers that provide MPS to end-user customers. This organization is not owned, directly or indirectly, by a manufacturer (including branches and subsidiaries). Direct MPS Plus Provider – An organization selling basic managed print services (supplies fulfillment, break/fix service, and equipment services) that is owned directly or indirectly by a manufacturer (includes branches and subsidiaries) and offers additional solutions around document management, document workflow, and/or business document processes. Independent MPS Plus Provider – An organization selling Basic managed print services (supply fulfillment, break/fix service, and equipment services), independent from a manufacturer of printer/MFP equipment or supplies and offers MPS Plus solutions such as document management, document workflow, and/or business document processes. Services and value proposition may be targeted to specific vertical markets or be horizontal in application. Sales/delivery model may be direct to end-customers and/or through channel partners. Size/scope of organization may be local, regional, or national. Best MPS Innovation Award - Each year we see new developments and initiatives in MPS that have the potential to redefine the way we view the industry. This award is intended to single out the individual, company, product, or process that can be genuinely hailed an innovation for the industry. The Managed Print Services Association (MPSA) is an independent, not-for-profit organization that serves the MPS industry. Its focus is on the development of standards, education, and industry guidelines that unite the different segments of the industry and bring value to all those participating. For more information about benefits and memberships, visit http://yourmpsa.org/Membership. Existing MPSA members interested in getting more involved with the MPSA can find out more about the committees and the MPSA here or contact us at info@yourmpsa.org. Dallas, Texas and Brno, Czech Republic, May 23, 2016 – Y Soft, a leading enterprise office solutions provider, has expanded its partner relationship with Xerox as the Powered by Y Soft provider in the Xerox Secure Print Manager Suite. Y Soft also released data on its growth, global customer base and year-to-date fiscal 2016 revenue. The existing growth, the Xerox expanded partnership and the recent announcement of the YSoft SafeQ workflow solutions platform, demonstrates the company is well positioned for growth in 2017. Referring to the announcement made today by Xerox, Xerox has expanded its partnership with Y Soft by choosing YSoft SafeQ as the solution for perpetual and flexible subscriptions in the Xerox Secure Print Manager Suite. Customers who purchase the Suite or its modules receive print management software powered by Y Soft. Over 14, 000 customers around the world use YSoft SafeQ as their enterprise IT strategy for reducing costs of critical business printing, copy and scanning; increasing document security and improving productivity. As a platform, YSoft SafeQ offers print management, document capture and workflow and 3D printers integrated with print management and accounting, into one solution. 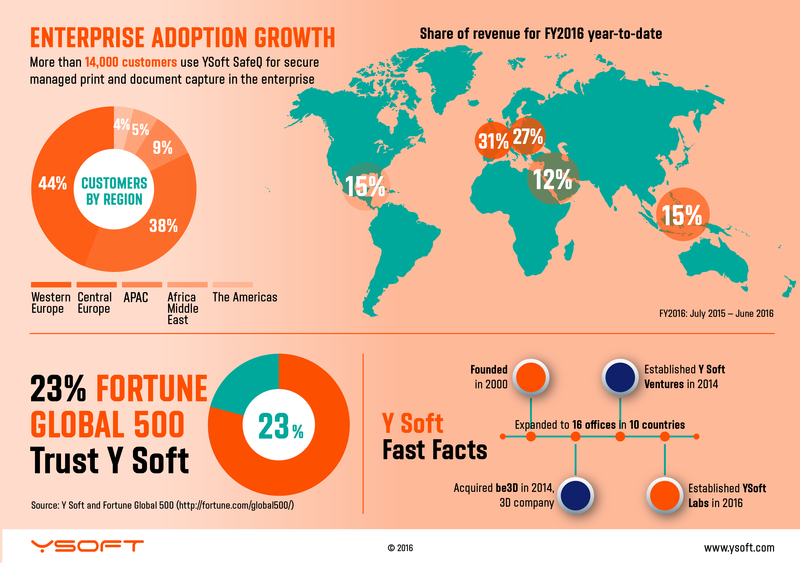 · 23% of the Fortune Global 500 use YSoft SafeQ. These companies represent automotive, building/construction, financial services, food/consumer products, healthcare and insurance, mining/oil production, pharmaceutical, telecom and utilities industries. · Y Soft is truly a global company with customers on every continent. Although based in the Czech Republic, the company exports more than 98% to over 120 countries. The data infographic can be downloaded here. Dallas, Texas and Brno, Czech Republic, May 17, 2016 – Y Soft, a leading enterprise office solutions provider, today announced new hardware solutions that complement the company’s flagship workflow solutions platform,YSoft SafeQ. The hardware products, YSoft SafeQube 2, YSoft Terminal Pro 4, and YSoft USB Card Reader 3, provide organizations cost-reduction opportunities in print management infrastructure and options for extending the investment of their existing printer fleet. Earlier this year, Y Soft announced a major update to YSoft SafeQ. The update extended YSoft SafeQ’s core benefits: reducing print costs, increasing document security and improving employee productivity through custom document capture and automated workflows. · YSoft SafeQube 2. Expensive servers often drive the high cost of print services. By using SafeQube 2, a lightweight appliance, typically 2-4 times fewer servers can be used to support print services. When used with Client Based Print RoamingTM (CBPR), a software module in YSoft SafeQ, SafeQube 2 serves as a local connection point for the MFD’s user interface, to perform authentication tasks and data collection for reporting reducing hardware costs. · YSoft Terminal Pro 4. While SafeQ is embedded into the MFDS of the world’s most popular brands, there are situations where a customer may want a hardware terminal interface to the MFD. Terminal Pro 4’s large, 7-inch capacitive touch screen provides a consistent user interface when an organization has multiple MFD brands or when the printer doesn’t support an embedded solution. In this way, organizations can realize the cost-savings of print management, while extending the investment in their current printer fleet. The Terminal Pro 4 is also the user interface panel in YSoft’s family of 3D printers, YSoft be3D DeeRed -- a professional 3D printer for large object prototyping and small volume manufacturing -- and YSoft be3D eDee, a 3D printer with print management and accounting system for the education market. · USB Card Reader 3. Designed to slot into YSoft Terminal Pro 4 or as a stand-alone with Y Soft’s existing embedded terminals, the USB Card Reader 3 is a small form-factor device that reads cards such as those commonly used for building access making authentication at the MFD easy and fast for users. The family of card readers uses LED indicator lights to confirm positive or negative authentication access. “Unlike our competitors, Y Soft is the only workflow solutions platform provider that designs, manufactures and tests our own hardware solutions. Customers are assured that our hardware works with our software and do not have to cobble together disparate solutions and live with incompatibilities,” said Václav Muchna, Y Soft CEO and co-founder. Additional information about YSoft SafeQ can be found on the company’s newly redesigned website at www.ysoft.com. (Cedar Rapids, IA) - Collabrance LLC announced the launch of the newest version of its www.collabrance.com website. The new content and design improves the user experience with better navigation, responsive displays, interactive graphics, videos, and a social media feed. The website also features a blog that provides current industry information on Managed IT Services. Collabrance has experienced the issues Service Providers encounter ranging from technology and personnel, to sales and marketing. The new website blog will be a learning center for visitors and is typical of the hands-on approach used by Collabrance to help Service Providers build and scale their Managed IT business.